"Countess of Hainaut" redirects here. For the wife of a Count of Hainaut, see List of countesses of Hainaut by marriage. Coat of arms of the county of Hainaut. The Count of Hainaut (French: Comte de Hainaut, Dutch: Graaf van Henegouwen, German: Graf von Hennegau) was the ruler of the county of Hainaut, a historical region in the Low Countries (including the modern countries of Belgium, the Netherlands, Luxembourg and parts of northern France and western Germany). In English-language historical sources, the title is often given the archaic spelling Hainault. The County of Hainaut was then divided between the counties of Mons and Valenciennes. Valenciennes and Mons are once again reunited in a consolidated County of Hainaut. 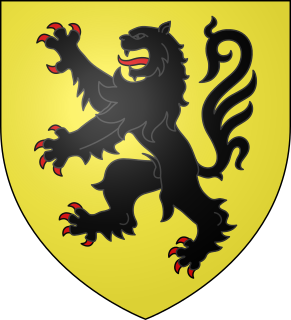 The Counties of Flanders and Hainaut are claimed by Margaret's sons, the half-brothers John I of Avesnes and William III of Dampierre in the War of the Succession of Flanders and Hainault. In 1246, King Louis IX of France awards Hainaut to John, but Margaret refuses to hand over the government but was forced to do so in 1254 by John and the German anti-king William II, Count of Holland. Margaret returned in 1350 in opposition to her son and held Hainaut until 1356. Jacqueline was opposed by her uncle John, Duke of Bavaria-Straubing, son of Count Albert I in a war of succession. John's claims devolved upon Philip III, Duke of Burgundy, a nephew of William IV, whose mother had been the sister of William. In 1432 he forced Jacqueline to abdicate from Hainaut and Holland in his favour. Charles II proclaimed the Pragmatic Sanction of 1549 eternally uniting Hainaut with the other lordships of the Low Countries in a personal union. When the Habsburg empire was divided among the heirs of Charles V, the Low Countries, including Hainaut, went to Philip II of Spain, of the Spanish branch of the House of Habsburg. Between 1706 and 1714 the Low Countries were invaded by the English and the Dutch during the War of the Spanish Succession. The fief was claimed by the House of Habsburg and the House of Bourbon. In 1714, the Treaty of Rastatt settled the succession and the County of Hainaut went to the Austrian branch of the House of Habsburg. The title was factually abolished in the aftermath of the French revolution and the annexation of Flanders by France in 1795. Although, the title remained officially claimed by the descendants of Leopold II until the reign of Charles I of Austria. In the modern Kingdom of Belgium, the title of "Count of Hainaut" was traditionally given to the eldest son of the crown prince, who was himself styled "Duke of Brabant". In 2001, with the birth of Princess Elisabeth of Belgium (now Duchess of Brabant), heir and eldest daughter of Prince Philippe, Duke of Brabant (now Philippe, King of the Belgians), it was decided not to feminize and award her the title of Countess of Hainaut, but to abolish it. William I, Count of Hainaut, was Count William III of Avesnes, Count William III of Holland and Count William II of Zeeland from 1304 to his death. The Avesnes family played an important role during the Middle Ages. The family has its roots in the small village Avesnes-sur-Helpe, in the north of France.